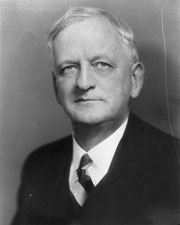 TUNNELL, James Miller, a Senator from Delaware; born in Clarksville, Sussex County, Del., August 2, 1879; attended the public schools; graduated from Franklin College (now combined with Muskingum College at New Concord, Ohio) in 1900; taught in the public schools, advancing to principal of schools at Frankford, Selbyville, and Ocean View, Del., 1903-1907; studied law; admitted to the bar in 1907 and commenced practice in Georgetown, Del. ; president of the board of education of Georgetown, Del., 1919-1932; unsuccessful Democratic candidate for election to the United States Senate in 1924; elected as a Democrat to the United States Senate in 1940 and served from January 3, 1941, to January 3, 1947; unsuccessful candidate for reelection in 1946; chairman, Committee on Pensions (Seventy-eighth and Seventy-ninth Congresses); banker; owned and operated a number of farms in Sussex County, Del. ; died in Philadelphia, Pa., November 14, 1957; interment in Blackwater Church Cemetery, near Clarksville, Del. Tunnell, James M. Ratification of the Federal Constitution by the State of Delaware. Dover, DE: Public Archives Commission, 1944.